Please donate whatever you can and help us raise as much money as possible. 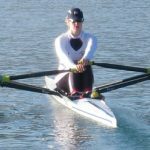 From the 17th-19th September 2016, our Patron, Naomi Riches, MBE will be attempting to set a new World Record for the fastest woman to row the River Thames, 165 miles from Lechlade to Gravesend. The aim is to do this in 50hours or less. Naomi hadn’t been our Patron for very long, and I didn’t know her that well, but I did know how instantly likeable she is, and also what an inspiring and special person she is. When we met early on to discuss ways in which she could help with our fundraising and profiling she told me of her idea. Naomi said she wanted to row the length of The River Thames from start to finish – on her own. She said it was something she had always wanted to do, and now she knew that to do it for IN-vision and raising awareness of nystagmus, would be the perfect opportunity. I felt so flattered and fortunate and scared all at the same time, but knew I wanted to be right there beside her and that together, with a lot of help, we could make this as big as our imagination would let us. So – we are asking you to be part of it, to get IN-volved and help us raise money, awareness and most of all hope. Naomi, with her unwavering belief and drive, really wants to make this challenge something for everyone, to celebrate ability over disability and to show that nothing needs to stand in your way. The Row takes place on 17th, 18th and 19th September 2016. You can volunteer for us on any of these days, be part of the build-up, fundraise like mad, row behind her, cheer from the bridges, and support Naomi in this amazing Record Attempt. Contact us NOW to be part of it!